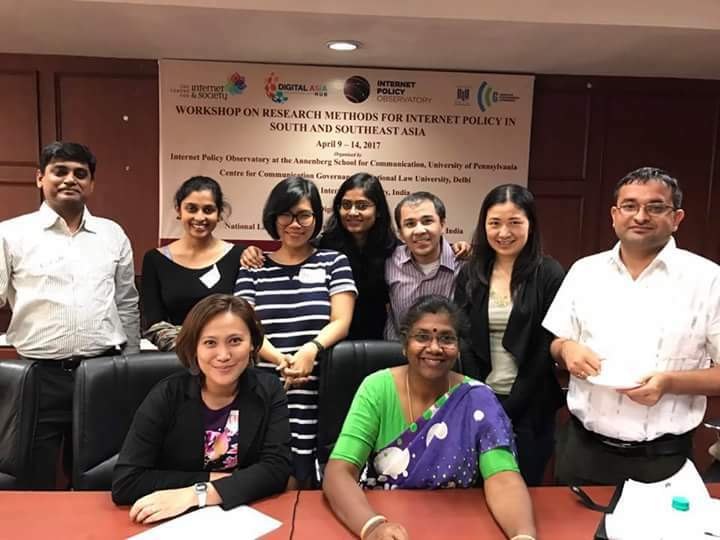 Christina Lopez, FMA program officer for gender and ICT, together with other participants who attended the 5-day Workshop on Research for Internet Policy at National Law University, New Delhi, India from April 9-14, 2017. The greatest benefits of attending an academic or professional workshop are the opportunities to build my network and increase my awareness on new trends happening in my area of interest. I had the pleasure of attending some training-workshops, conferences and fora, both in local and abroad since I joined FMA in 2015. This year has provided me with the opportunity to improve my communications and research skills. It all started when my supervisor forwarded an email with the subject line “Call for Application: Research Methods Workshop for South and Southeast Asian Digital Rights Defenders”. She asked me if I’m interested and later encouraged me to apply. Three months later, I received a congratulatory email saying that my application was accepted as a participant to the Internet Policy in the South & Southeast Asian Region Research Methods workshop, which will be held at the National Law University in New Delhi, India. 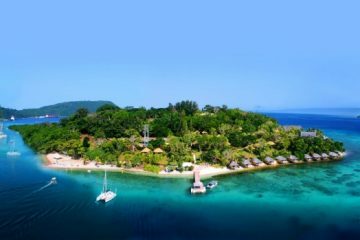 Apart from acceptance, they also granted me a scholarship that will support my travel to New Delhi and accommodation for the duration of the program. The Internet Policy in the South & Southeast Asian Region Research Methods Workshop was organized by the Anneberg School for Communication’s Internet Policy Observatory of University of Pennsylvania, the Center for Communication Governance of National Law University, the Center for Internet and Society and the Digital Asia Hub. The workshop brings together young scholars, feminists/activists, lawyers and technologist for a 5-day practicum on using methodologically rigorous, data-driven and contextually appropriate research for advocacy. 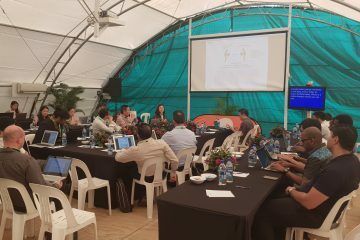 The workshop was designed to cover both qualitative and quantitative, online and offline research methods, and served as space for hands-on training and project-based learning. The program also aims to strategically build collaborative possibilities among the participants and speakers, expand research capacity of practitioners and digital rights advocates, and to provide the skills and know-how to ‘unresearch’ and data to advance advocacy efforts. What did I learn from the workshop? As a non-fluent English speaker, I am glad that I met a new diverse group of friends representing various sectors from South and Southeast Asia. I had the opportunity to exchange ideas, share resources, participate in group discussions and develop friendships with them. I also had the opportunity of attending awesome presentations during the lunch presentations. Some of these presenters shared their finished/current research, advocacy works and campaigns and movement building. The topics presented included the National ID system in India, Holistic Security Approach for Human Rights Defenders, and Gender and Surveillance. Those presentations allowed me to learn more about some of the emerging issues that surface in online space. There was one session during the 5-day program that’s really something new for me. This session was focused on the application of Social Network Analysis (SNA), which aim to study the social media. 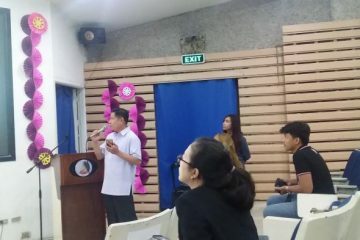 The SNA session covered the mechanisms of data collection from different social media platforms like Twitter and other blogsites, and the application of social network analysis to analyzing salient issues in relation to the internet policy activism. The session has two parts. First, the topic covered the theoretical aspects of social network analysis and basis of data collection methods; and the second topic was dedicated to hands-on practice by using real datasets collected from chosen Twitter hashtags or keywords of each group. For the gender and human rights group, the chosen hashtags were #Gender #GenderFOE #WomensRightsOnline #FOEKG #FOESG. Through working with a real data sets, we extracted useful information, interpreted the data and finally communicated them effectively through visualizations. We used free and open source software applications for data collection, data extraction, social network analysis and visualizations.